Daniele Chiesa was born in Bergamo, Italy in 1973. Determined to make a life for himself playing the guitar, at the age of twelve he began to study both classical and jazz guitar. In 1994 he moved to Cremona to take up a place in the musicology faculty of the university that is also home to the internationally famous Violin making school. From the 16th century onwards, Cremona has been renowned as a centre of musical instrument manufacture, beginning with the violins of the Amati family, and later included the products of the Guarneri and Stradivari shops. To the present day, their work is widely considered to be the summit of achievement in string instrument making.Continuing to play during his early student days he was disheartened when his treasured guitar was stolen from his car. Unable to afford a new instrument and encouraged by a friend Daniele decided to attempt to make a new one himself. The experience fired his fascination with the design and manufacture of guitars and lead to him swapping his studies in musicology to train as a luthier. Simply put Daniele’s life from this point became a series of unique learning experiences which have culminated in the specialist work he does today. 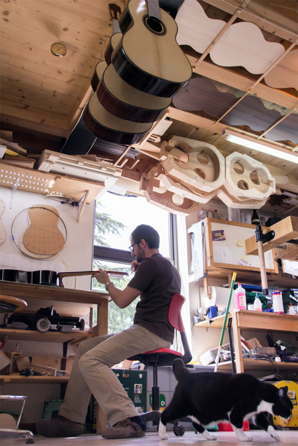 By the time Daniele graduated as a Maestro Liutaio from Cremona in 1998 he had already achieved a growing reputation for making and repairing guitars but understood that if he was to progress then he needed to learn from those considered to be the best. His first stop was Santa Cruz, California where he worked for the legendary guitar maker Kenny Hill and where he saw at first hand how a traditional Spanish guitar was constructed. A year later he was invited back to his home town of Bergamo to work with classical guitarist and guitar maker Paolo Viscardi. Both this and his experience in America began to show Daniele that making a traditional guitar brought together all the craft skills he had learned. The Millennium saw Daniele returning to California but this time in the San Francisco bay area working with Tom Ribbecke. Staying a year in his workshops Daniele gained a different prospective making among other things the ‘Healdsburg’ archtop guitar that made Tom famous with its versatility and enhanced bass response. Next followed a period of hands on experience where Daniele learned the techniques of grading and cutting different guitar making materials including rare Brazilian rosewood. In a final twist to his story on his return to Italy he met with some Spanish students on an exchange visit from his old college in Cremona. These students told him about a forthcoming guitar festival in Cordoba and as ever seeking more knowledge Daniele travelled to Cordoba where he met and took a class with the master guitar maker Paco Santiago Marin. This rich learning experience with its deep rooted traditions convinced Daniele that his future lay making high quality classical guitars. To do this he recognised that he must be close to the heart of this tradition and set up a workshop in Granada developing and refining his own instruments with the invaluable help of masters like his former teacher Paco Santiago Marin, the great Antonio Marin and his nephew José Plazuelo, and the late Rolf Eichinger. Daniele describes the years between 2002 and 2010 as the final stage in his evolution as he mastered all the traditional and modern skills needed to create guitars which have his unique sound. 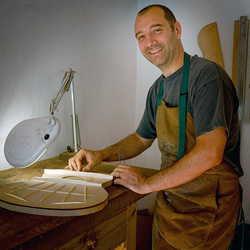 Now living in the mountains of Andalucía, Daniele continues to develop the sound of his classical guitars through his ability to bring innovation, to his construction techniques. For example his unique use of vacuum processes continues to be of great interest to guitar makers. Daniele is now regarded as one of the worlds most talented classical guitar makers and his instruments are played by some of today’s most talked about classical artists, well known teachers and guitar collectors and are now available through a network of classical guitar dealers across the world. In great demand to talk about his work Daniele travels to Guitar events worldwide where he demonstrates his skill and shows his beautiful instruments.